During our marriage, June would occasionally send me little love notes. 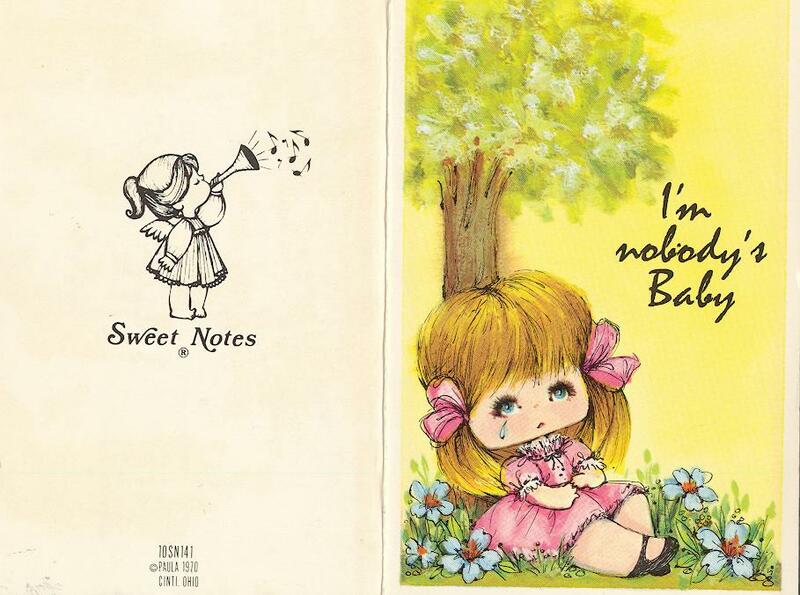 They were short and cute little notes that expressed her love. While she could have just given them to me directly, she made them a very special surprise by mailing them to me. They were always a delight! This was one of the many things that June did during our marriage years that made our life together an "Adventure." I have a few examples of her love notes displayed below. Unfortunately I do not have the dates on all of the notes. They are however representative of notes given me over many years. They never stopped coming until finally Alzheimer's took over June's life. Most notes were lost over the years including our letters to each other while I was serving in the Army and a thousand miles away from June. The notes continued over the years of our marriage and ended after the year 2000 when Alzheimer's begin to take over June's life! 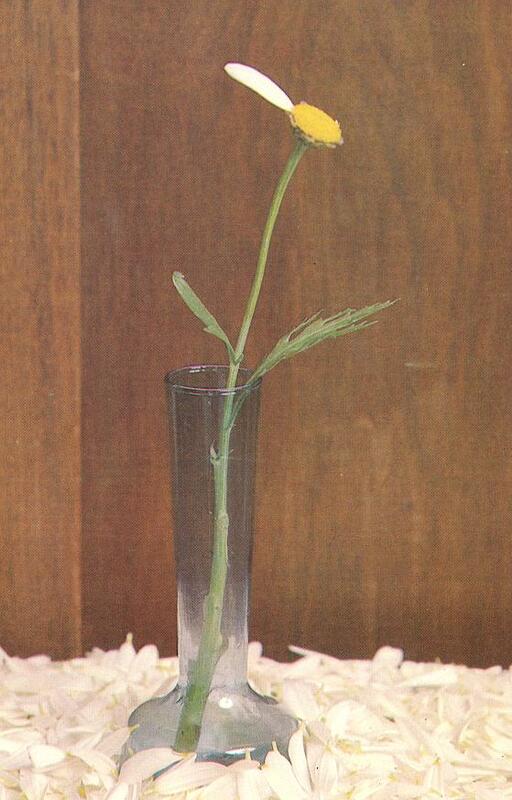 While June continued to do very well until after the year 2002, the last love note ended in the year 2000. The signature was still strong and the greeting was appropriate. Birthday cards and Valentines from June were last received in the year 2003 as June was rapidly coming under the influence of Alzheimer's...her signature was shaky and written greetings with the signature had words out of place or inappropriate...it was so sad to observe the impact on June's mind. I never called June by her given name. I always used one of my pet names for her. Her use of the name "Doll" in the signature on the first undated example shown below was one of such pet names that I frequently used. 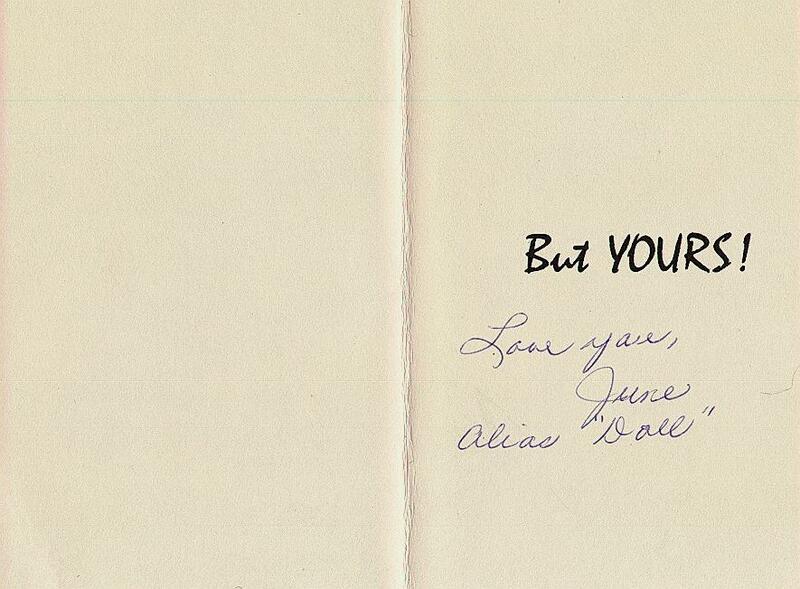 In the 1983 love note June uses two of my pet names for her - "Doll" and "Monkey Putt". 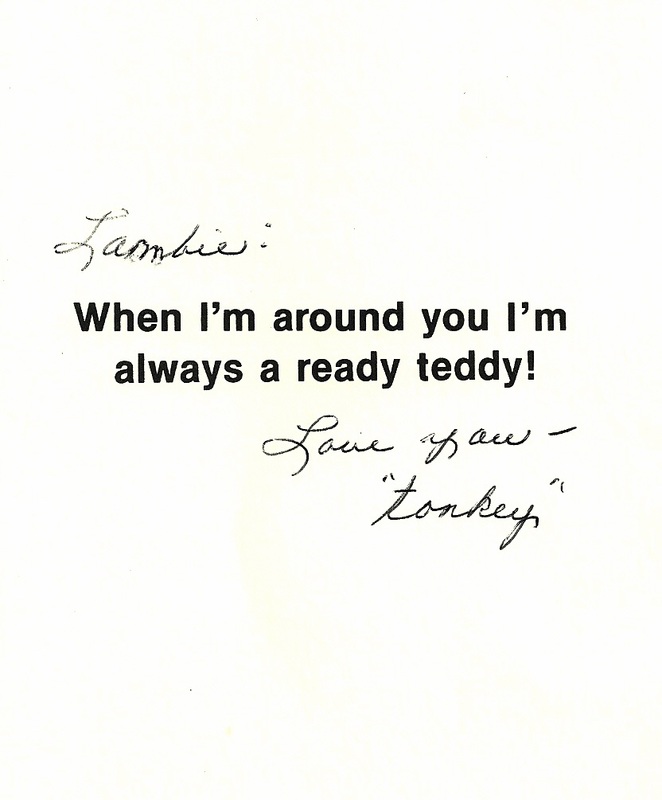 In a 1986 note she uses "Tonkey" - pronounced "Tunkee". 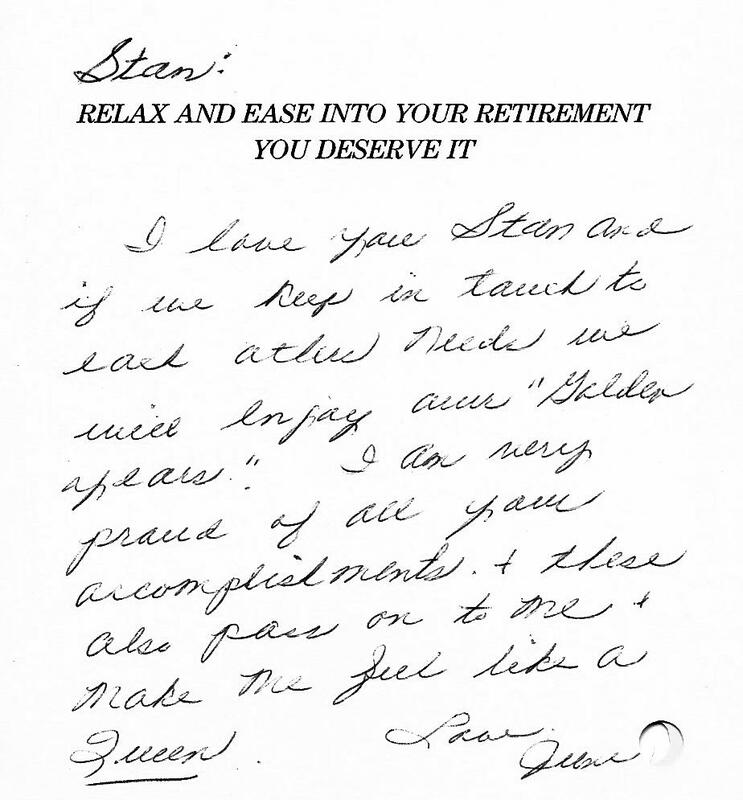 (This note on the below card was one that June had sent to me just prior to my July 1st career retirement in June 1984.... ...I was taking the first of two retirements. This was an early retirement from a managerial position (30+ years) at State Farm Companies. This permitted me to devote full time to my first love, the forensic sciences. Prior to that date, my forensic science work was a part time endeavor and had been for over 20 years. (June and I were both 56 years of age.) 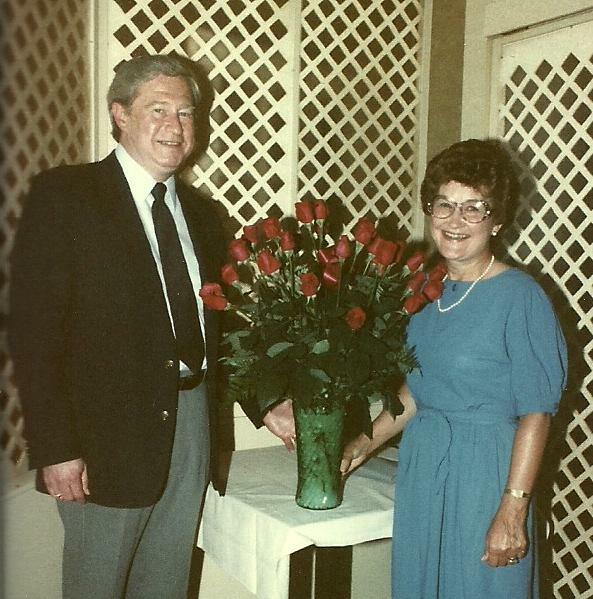 June would become my administrative assistant in my final forensic career years that ended December 2004. (20 years later.) It ended then only because Alzheimer’s was taking over June’s life and I needed to focus my attention on her care for the rest of her life. The “Golden Years” that June talked of had really not arrived although most of those 20 forensic years were some of the happiest years of our lives. While June talked of how I made her feel like a Queen, having June for my wife made me feel like a King! One might say it all happened in the late fall of 1951 when I proposed to June. I played an ace and I won a Queen when she made me King of her heart! Over night I went from a Jack to a King! ) I had won grand prize in the lottery of Life. 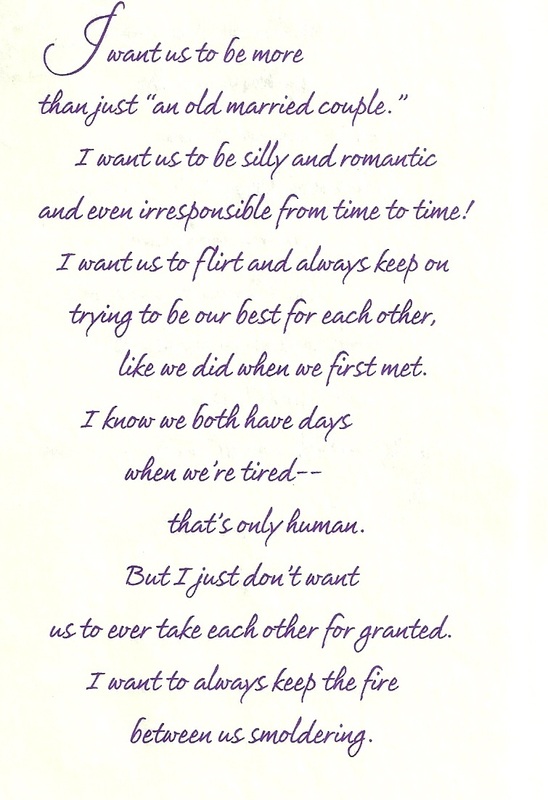 The last love note (below) received from June was a printed card that I received from June on 5 October 2000. 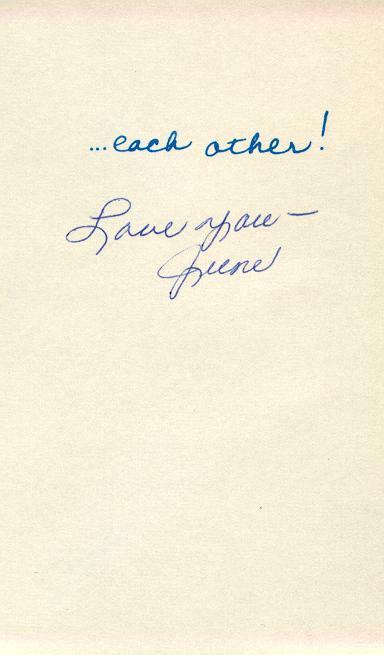 Because June was at that time, into the fourth year of her Alzheimer's, I took special note of this card and dated it on the reverse side. The card came tied with a violet ribbon and was fitted into a flowered folder. It was titled "A Lifetime Love Affair". For me, this last love note from June always causes me very emotional moments. The below picture of June was taken one month after the above card was received from June. Picture was taken at Cary, NC during a birthday party for June in November 2000 at our daughter Susan's home in Cary during one of our visits. Her face does not show any signs of the disease yet and did not until after the year 2002. 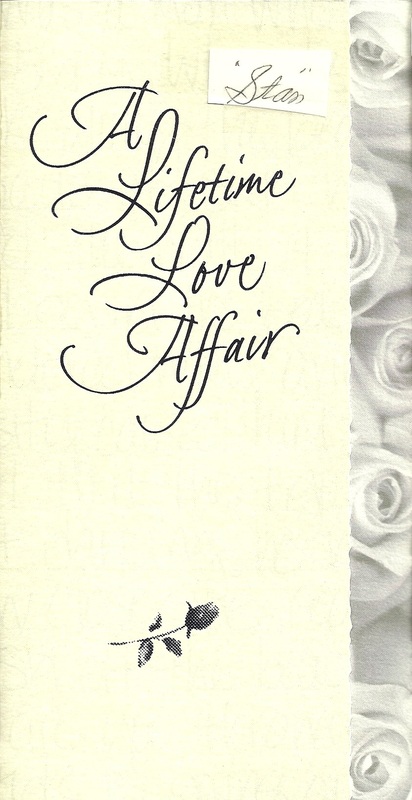 The year 2000 in was the year in which I received the last love note from June in the form of a card entitled: “A Lifetime Love Affair”. 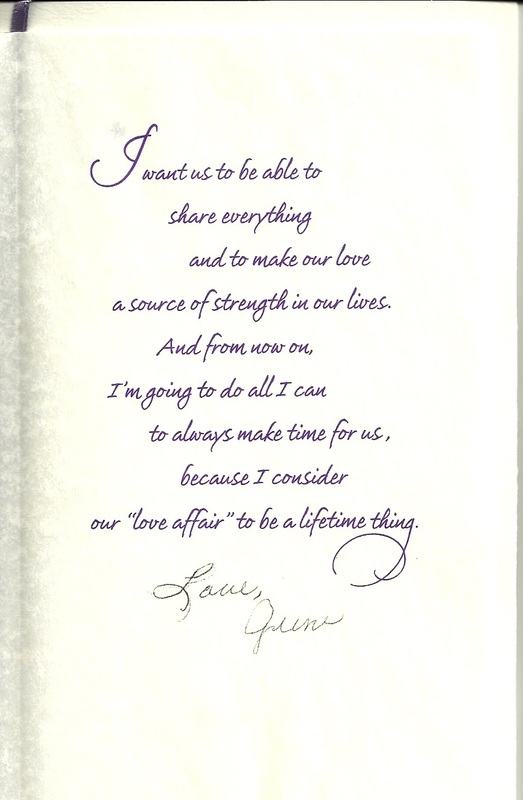 This was June’s 3rd year since being diagnosed with Alzheimer’s in January of 1998 but it was the 4th year since her symptoms in 1997, This card seemed almost like a final statement from June on how she viewed our “Lifetime” together. I am sure she could see the distant storm clouds on the horizon and wanted us to make the most of the remaining time we had together. We both had a goal of living our remaining life together to the very fullest as long as possible before Alzheimer's closed in on us. With such a goal in mind, the year 2000 was a very busy one indeed. Below is our travel log for the year 2000. 1. We started the year with a trip to Maui, Hawaii in January for a week at the "Outrigger Hotel.". We crammed into the other months of that year as much enjoyment as we could while attending forensic conferences. This enabled us to visit with as many of our old forensic friends as possible. I spent very little of my time with forensic business at the conferences and spent as much time with June taking part in the many conference social events that were always made available at such conferences. 2. In February we attended the conference of the American Academy of Forensic Science (AAFS) at Reno, Nevada and Lake Tahoe. 3. The forensic firearms conference (AFTE) at St. Louis, Missouri in June 2000. 5. In October we attended the conference of the forensic blood stain pattern people (IABPA) at Tucson, Arizona. 6. We visited our daughter Susan in Cary/Raleigh, North Carolina in November to celebrate June’s birthday. 7. In early December we visited Branson, Missouri for their celebrated "Christmas Show" to finish out our travel year. Our daughter Julie hosted Christmas Eve that year at her home in Fridley, Minnesota just a short distance from our home. June loved to buy cards of all kinds for her family, friends and relatives. 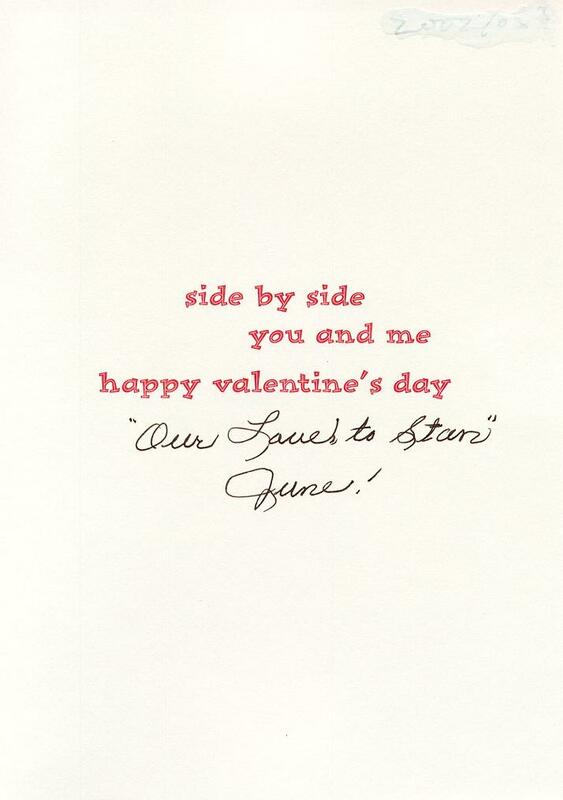 This year (2008) I decided to look at June’s previously purchased cards and see if June had purchased any Valentines. If I found any, I intended to send them out to her family and any one else appropriate as a Valentine from June. My search revealed the manila envelope stuffed with valentines. 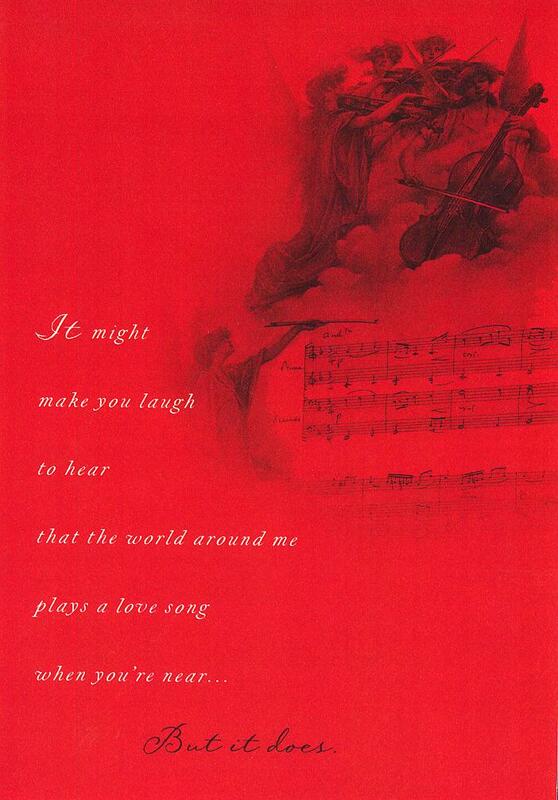 Immediately below are photos of the front cover of the unsigned Valentine and the inside page with the verse. The front cover has a beautiful layered construction. 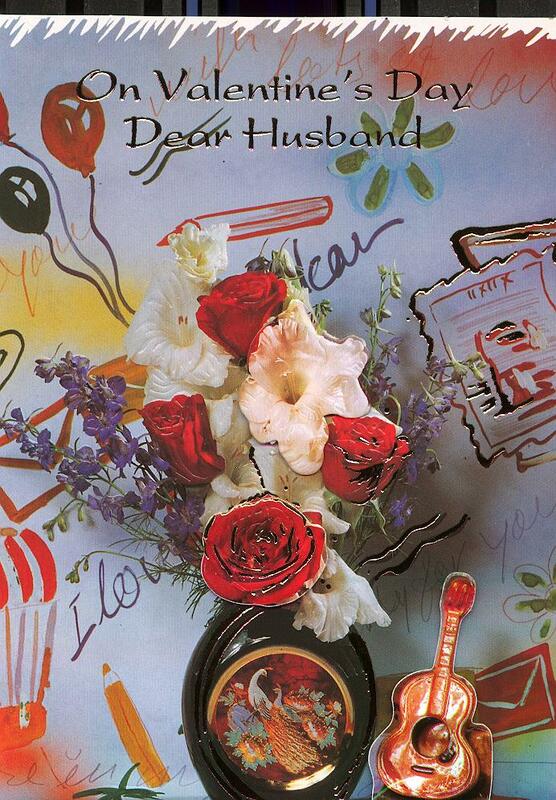 The roses and the guitar are all cut out of cardboard and glued on the face of the card. 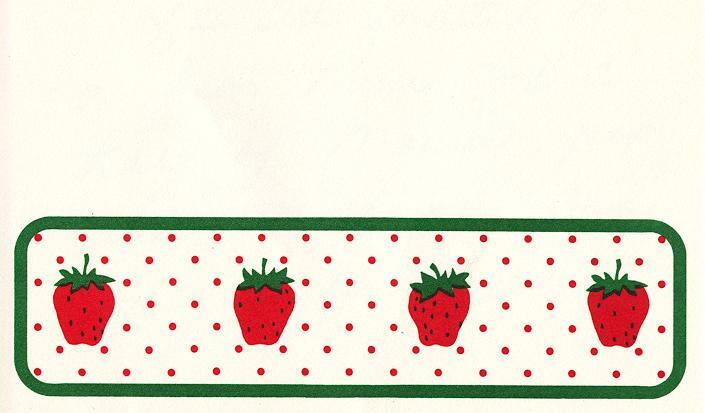 The top of the envelope June used to save them in is also shown. Note: Below this card are two other cards that June gave me around this period of time but they had no dates and I can only guess that they represented the same general time period. the first one has a short love note from June and her signature. You can see her Alzheimer's handicap at work in the misuse of one word. 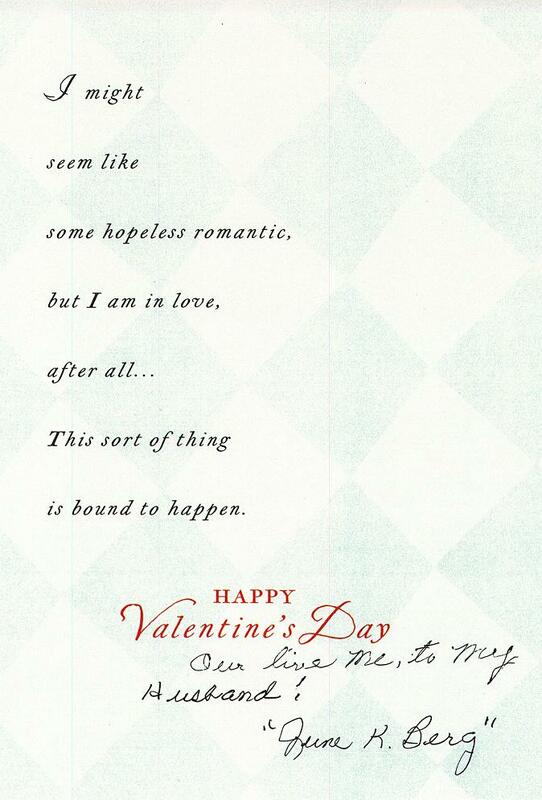 The second card also has a short love note from June but it is also a more severe example of Alzheimer's at work. The words are not appropriate nor are they in the right order. June also signed it more formally with her complete name. 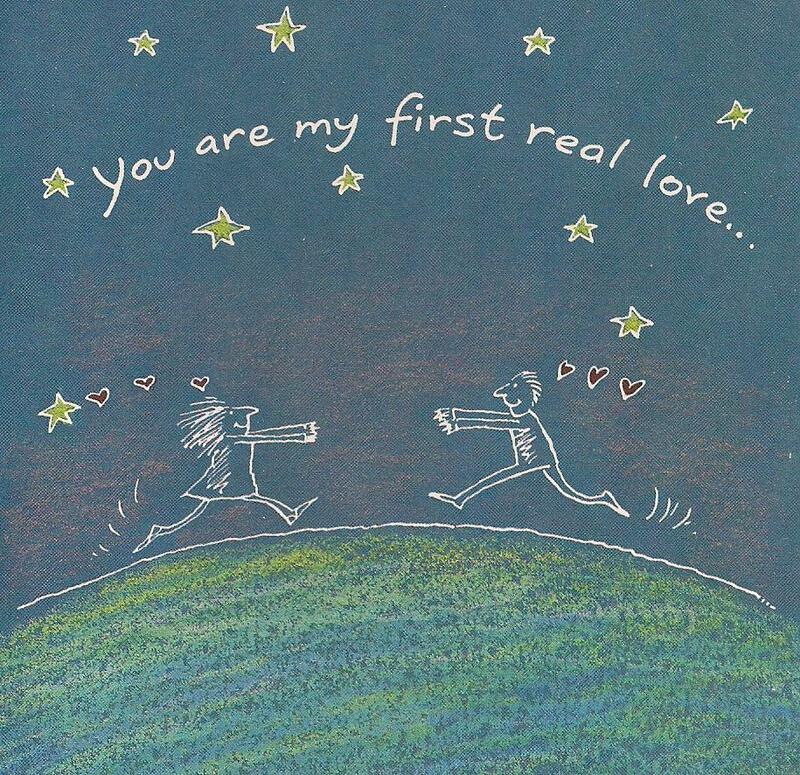 It is however, one of the most beautiful and sentimental of all of the cards that she has ever given me! It humbles me every time I read it. 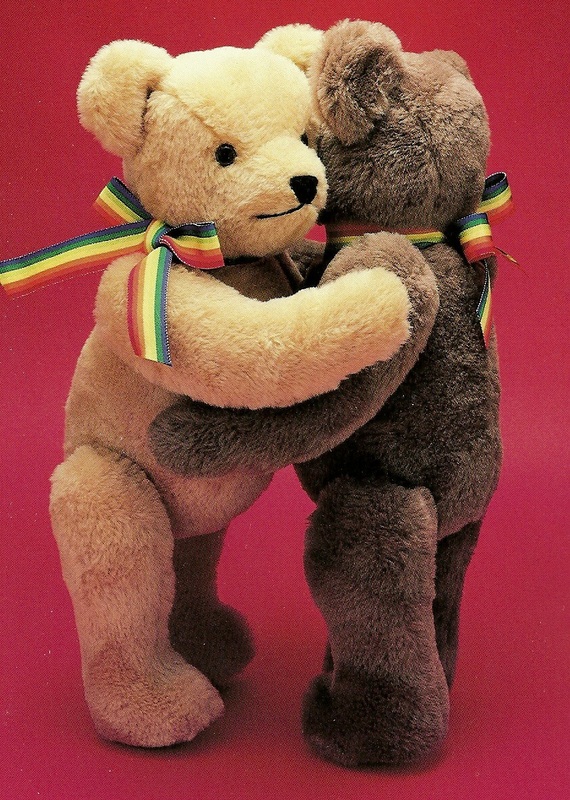 June's Very Special Card - Purchased by June in 2002 to be Used in 2003. Below: This is the first of the signed cards that June gave as described above. Timing is around 2003. June and I would frequently exchange more than one card on such occasions. It is not known if the below card was a second card purchased for the year 2003 - Due to her Alzheimer's , June would not have remembered buying other cards. June tried to put a short note above her signature but because of her Alzheimer's handicap the note did not come out as she had intended. 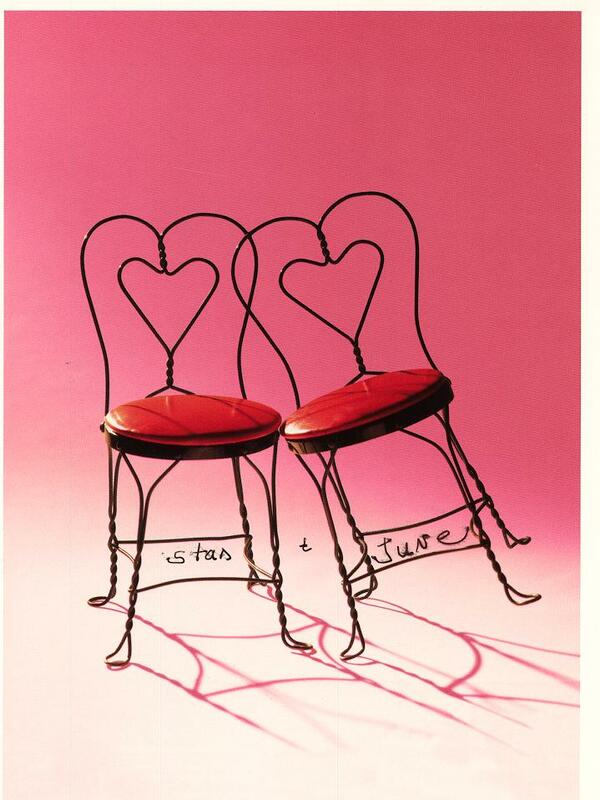 The front of the card shows a typical June added touch where she has designated the chairs by our names. Below is the second card referred to above. 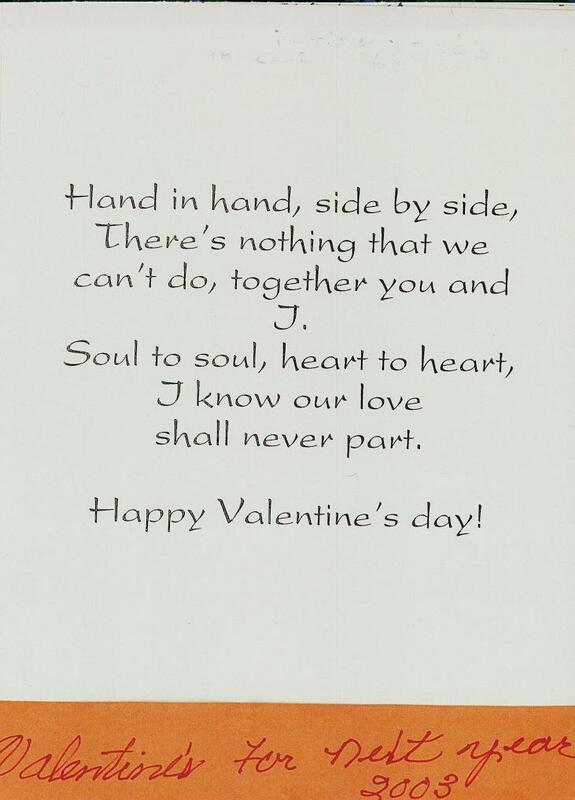 This card shows the extreme difficulty that June was having in writing a love message above her signature and making it come out in an appropriate manner. I am sure that June meant "Our Live Me, to my Husband!" to read instead - "My love to my Husband!" She also signed it formally with her complete name instead of her usual of "June." The card is however, one of the most beautiful and sentimental of any card I have ever received from June. I do not think I have ever received a card that has more humbled me than her sentiments in this card. G'Anna Dent - Amarillo, Texas - (19 September 2015): "Stan, that is the absolute sweetest thing ever! And apparently you called her "Doll" a lot! Love this!!!" 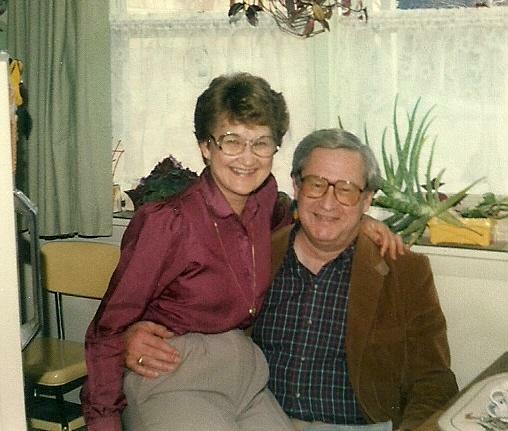 Jacqueline Crowther - Manchester, United Kingdom - (19 September 2015): "How sweet such fond memories Stanton, no wonder your poor hearts broken but what a joy to have experienced such love and devotion and have had such a beautiful person in your life." Bertha Dusenberry - West Lafayette, Ohio - (19 September 2015): "How sweet of June heart emoticon . What a lovely lady she was...beautiful inside and out with a very loving heart. God Bless you Stan." 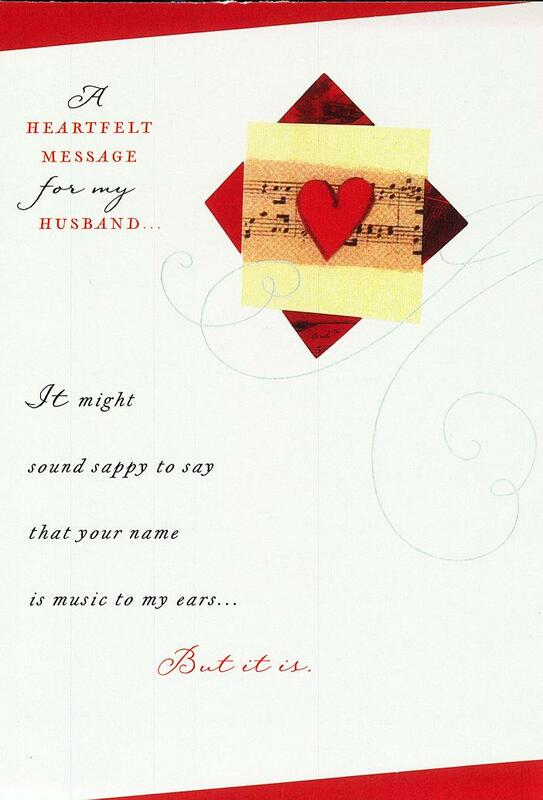 Marsha McKneely Ault - Nacogdoches, Texas - (19 September 2015): "June's tradition of love notes makes me want to do them for my husband more. Love your post. Thank you for sharing something so treasured and personal. Love is forever." Dianne Creel - Concord, North Carolina - (19 September 2015): "Precious memories, from your one and only~~Doll!... What a blessing of love the two of you shared." Lynn Piper - Blandford Forum, United Kingdom - (19 September 2015) : "You are both so lucky to have found someone who loves you so much." Bridie Breen - Manchester, United Kingdom - (19 September 2015): "lovely and so personal those gems shared." Janet Ashenden - Derby, United Kingdom - (19 September 2015): "Such a lovely memory for you to have kept." Bessie Peery - Nashville, Tennessee - (19 September 2015): "AWWW !! how sweet is this, so many memories for you Stan, I know you enjoy everyone,thanks for the share." 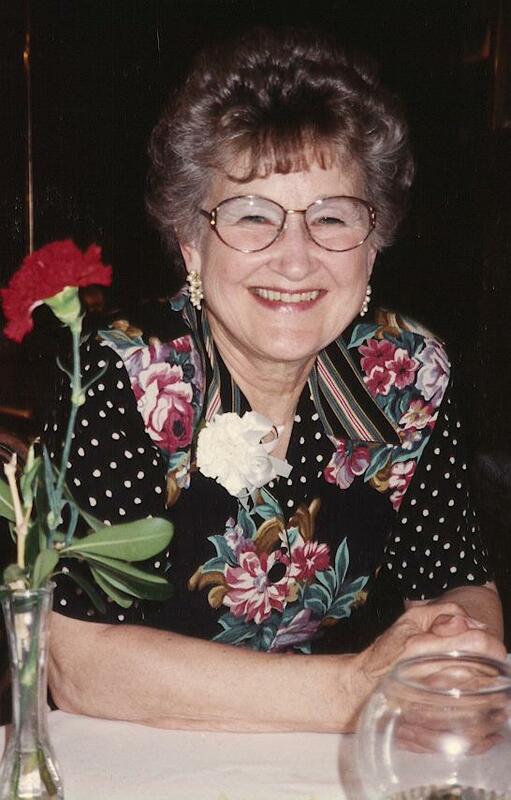 Bonnie Phillips - Eugene, Oregon - (19 September 2015): "How melancholy and sweet Stan. She must have been a Blessing to you as I can understand by her note. Why do the Most wonderful die before their time?" Diana Perera - Colombo, Sri Lanka - (19 September 2015): "My late husband, we would do the same when he found he was losing his voice and hearing, while suffering from dementia." 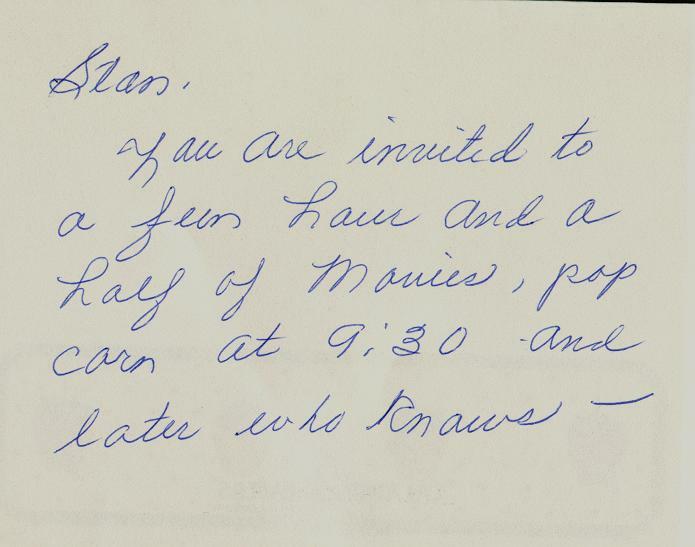 Dawn Henriksen - Eden Prairie, Minnesota - (19 September 2015): "So so sweet Stan - wish I could have seen the letters and notes that my grandparents left for each other. They didn't save them." Gilda Yen Torino - Manila, Phillipines - (19 September 2015): "So sweet and beautiful." Catherine Jones-Hatcher - Richmond, Virginia - (19 September 2015): "wink emoticon so sweet! 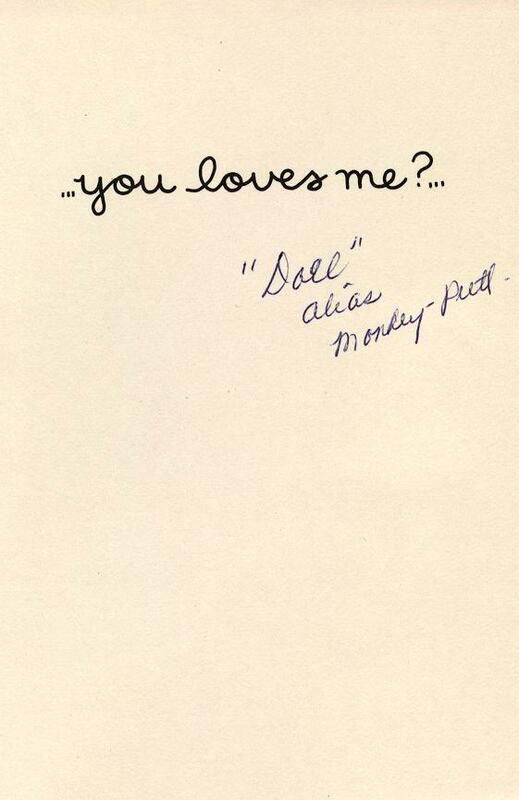 Love this... my hubby used to call me "dollbaby" ... and often left me handwritten notes... 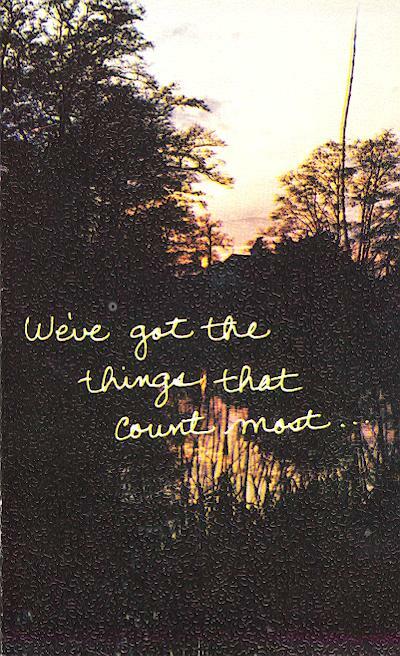 I miss that, but like you... kept them all. I still read them." Jackie Irving - Liverpool, United Kingdom - (19 September 2015): "No wonder you called yours and June's life together an adventure Stan....from what you tell us about her and all your stories ....she sounds like a lovely fun person.....bet she always had a twinkle in her eye as well as that beautiful smile ....it's wonderful to know she's still in your heart and very much part of your life...take cafe and God bless Stan." Tied with a violet ribbon. as I inhaled the breath of her devotion. our young love and kept it alive. 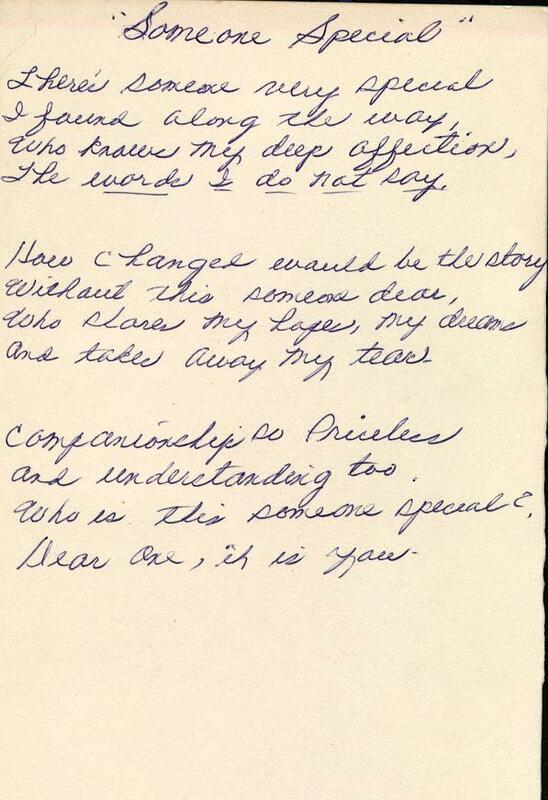 Written for Stan and June Berg. Sandra Lynn Valentin-Mitchell - Chicago, Illinois - (3 May 2017): " I read all of the page. 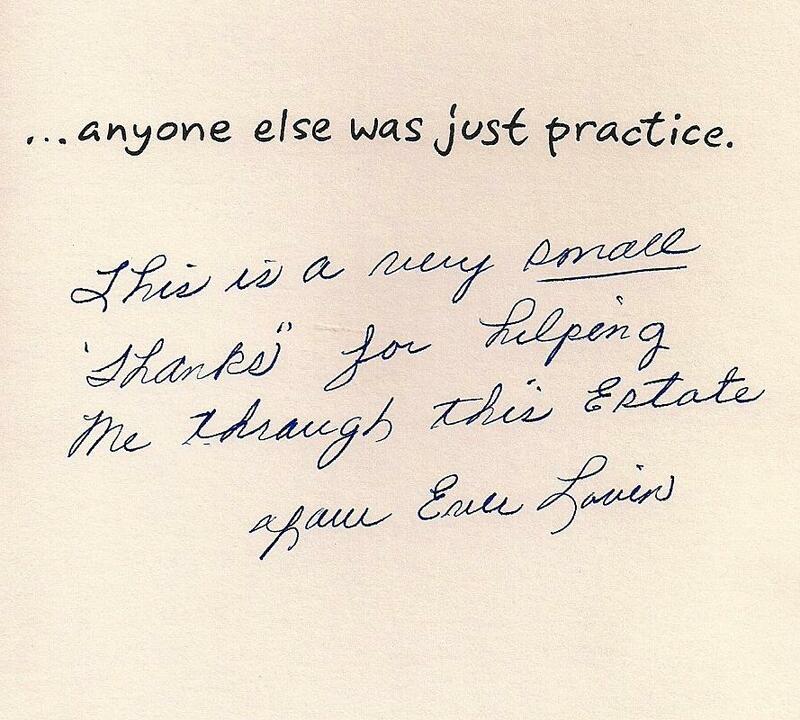 June had beautiful handwriting and a great taste in greeting cards. Stan, it doesn't take a rocket scientist to see how much June loved you. It broke my heart to read what she wrote about spending the golden years with you. 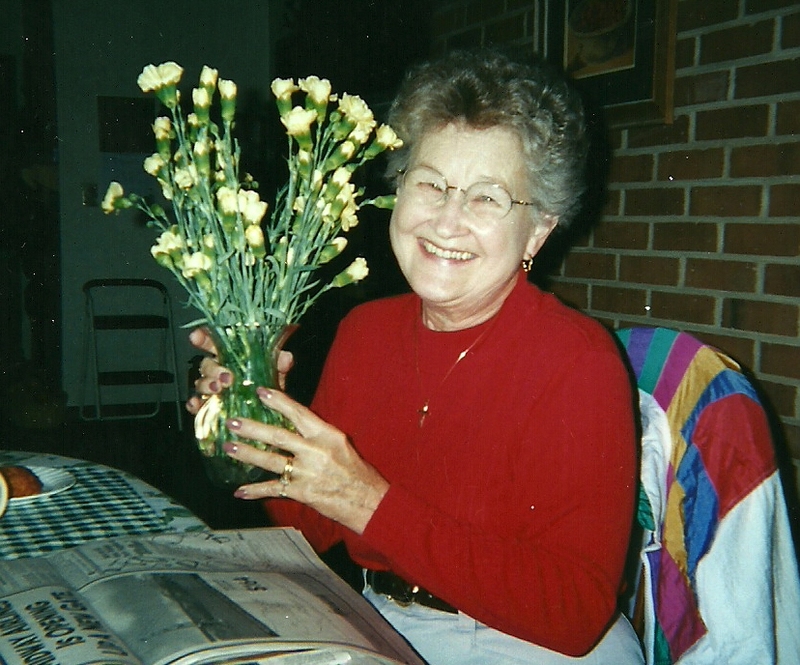 She had other plans, but then developed Alzheimer's Disease. This happens to so many people Stan. You are not alone. So many do not live to see the Golden years. 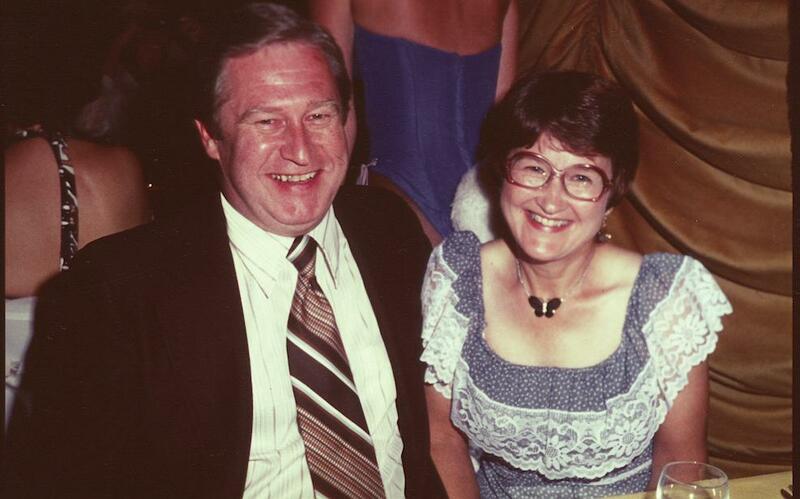 Stan, thank God that you had June for all the wonderful years that you did. So many do not have love in their life, nor ever experienced it. You and June had something very special. You were truly blessed and now you are blessed with your children, grandchildren and great grandchildren. June and you are responsible for them. They are a product of the both of you. How special and beautiful is that? Love."